The Maid Marian Chapter of IODE began as a Junior Chapter July 05, 1942 under the auspices of the Robin Hood Chapter (disbanded 2001). Two years later, in July of 1944, Maid Marian became a primary Chapter. 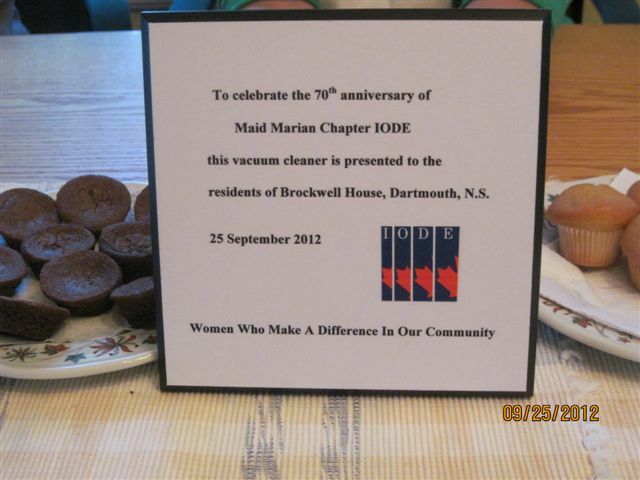 Over the years, IODE Maid Marian Chapter members have made a strong imprint upon the community of Dartmouth and area. They have provided books to schools in Nova Scotia and Labrador, NL. Bursaries are given annually to graduating high school students. Funds are contributed toward kidney research at the IWK Children`s Hospital in Halifax. In addition, they contribute to the local food bank as well as to shelters for the homeless. Patriotically, they welcome new Canadians; members represent IODE and Canada at Remembrance Day cenotaph ceremonies. These activities are ongoing. Maid Marian Chapter`s fund-raising has been through card and book sales and, at Christmas, the sale of evergreen wreaths and hand-knit mittens. The latter continues as a major fund-raiser. Chapter motto - "By Doing, We Serve". Maid Marian Chapter donates an annual bursary to a graduating student from Dartmouth High School. In 2015 the chapter was designated "Donor of the Year" by Dartmouth High School for their many years of supporting their graduates. Enrolled in or entering an educational institution by September 1. The sale of mittens to help support the chapters bursary fund was initiated in October of 2000 by Ruth Lelacheur, a long time member. Ruth has been at the helm of this project since its beginning. With the ready assistance of chapter members, this program has been an absolutely-tremendous success. Almost $25,000 has been raised. This money enabled Maid Marian Chapter to present some fifty-five bursaries to local high school graduates as well as assisting other Chapter projects. Since the first year sales have increased by over 400%. Recently Ruth has retired from this project. Inspired by Ruth's leadership, it is hoped that Maid Marian Chapter will be able to continue with their mitten sales. Several afghans were donated to Northwood Centre in Halifax for use of resident seniors. Several afghans were also donated to the IWK Children's Hospital for the use of their young patients. With the help of a friend of IODE Maid Marian Chapter more than 5000 finger puppets have been donated to the IWK Children's Hospital. These little puppets can be seen in many places around the hospital and help to ease tears and fears when having blood drawn or seeing a doctor. Remembrance Day Ceremony 2014 held at Sullivan's Pond, Dartmouth. IODE chapters in the area proudly display their flags at the Remembrance Day Service and wreaths are placed at the cenotaph to remember those that have served our country. Maid Marian Chapter members proudly carried the Corporate Logo flag in the parade. Sisters Barbara MacKenzie and Marjorie Hare, 60+ year members of IODE Maid Marian, were honoured at their 70th Anniversary Celebration. Vacuum Cleaner donated to Brockwell House in celebration of 70 years as an IODE Chapter.